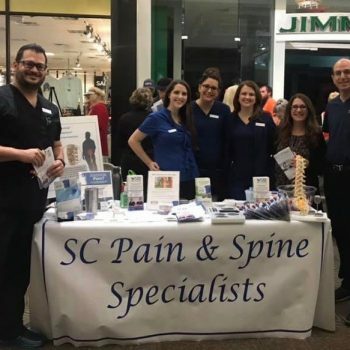 SC Pain and Spine Specialists hosted a Ribbon-Cutting Ceremony on Monday, November 12, 2018, to celebrate the Grand Opening of our new Carolina Forest office at Midway Medical Plaza in Myrtle Beach, South Carolina. Visitors enjoyed a light lunch while meeting with our providers and staff. They were able to tour the office and see the transformation of the old Surf’s Up Arcade into the beautiful new Midway Medical Plaza. Many thanks to the Myrtle Beach Chamber of Commerce for their help with the ribbon-cutting ceremony.